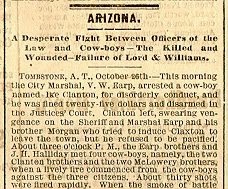 There are no silver stars for guessing that today marks the anniversary of what has become known as the Gunfight at the OK Corral. 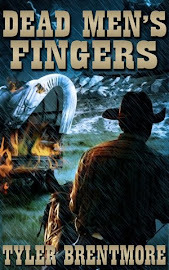 The fact is that such a gunfight occurred; the how and the why and the who are what turned that fact into a legend that has become mythologized in its constant retelling, mostly on the large and small screens that dominate our view of what was the ‘American West’. Life at the time was no walk in any park, as an almost contemporary photograph of Tombstone attests. The town came into existence around 1877 due to the productivity of its silver mines, estimated at $40m-$80m in just over the 10 years of its heyday. "Decent folk" certainly tried. There were four churches, a school, ice-cream parlour, bowling alley and an opera house, but alongside over 100 saloons, 14 gambling halls, numerous dance halls and brothels, and situated only thirty miles from no-questions-asked Mexico, anyone attempting to uphold the law certainly had his hands full. 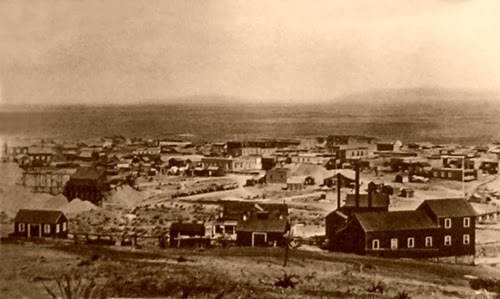 Vigil Earp was the City Marshal as well as Deputy US Marshal for the area; Wyatt Earp no more than a temporary City Deputy on whom his brother knew he could depend. Yet it is the younger Wyatt who claims the mark in history, probably due to his life extending into the era of the movies. The silent 'Westerns' certainly fascinated him, and he became an advisor to both William S Hart and Tom Mix, eager to hear first-hand of life during their childhoods. Standing in the shadows were John Ford and a very young Marion Morrison, aka John Wayne. But it seems Wyatt never spoke directly of the Gunfight. It wasn't until after his death in 1929 that a biography was published in 1931 by Stuart Lake, Wyatt Earp: Frontier Marshal. It might have been fictionalised, but it gripped the imagination. A year later the Gunfight at the OK Corral eased onto the big screen as Law and Order (dir Edward Cahn) with Wyatt Earp masquerading as 'Frame Johnson'. The rest, as the saying goes, is legend and mythology. Photograph reputedly of Wyatt Earp 19 months after the Gunfight.